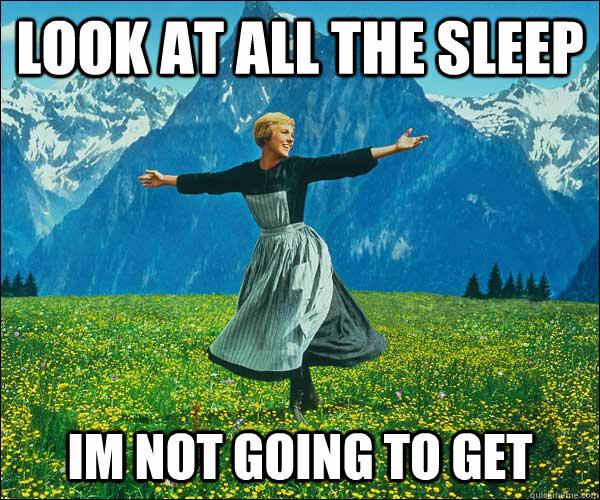 Illness + Sleep = Nope. You know what? So would I. Instead, I wake up several times a night in pain. Instead, I wake up several times a night gasping for breath. You think it “must be nice” to take a nap in the middle of the day? I sometimes cannot function without that nap. That’s right, cannot function. Or I literally just conk out. I have no choice. I don’t realize I’m doing it. Imagine sleeping all you want… but never being rested. Imagine having all the time in the world to sleep, but always being exhausted. Imagine never, in your life, feeling rested. Imagine people asking how much sleep you’ve had, and being shocked at how little or how much. Because there is no middle ground. It’s extremes, no matter what. Instead, it’s just something that happens because my body crashes. Not because I have a choice. Not because it’s “great” or “wonderful”. And that’s on nights I can sleep, not on the days where I go over 48 hours with no sleep, because I physically cannot. I wish it did. That’d make things easier. It’s beyond frustrating when people think that I’m sleeping this much because I want to, or that it’s good quality sleep. Thanks to too many shoulder dislocations, I wake up with searing nerve pain multiple times a night and almost never get quality sleep. And napping during the day? Without naps, my muscles stop working because of course, illness. UGH.